Medicine Hat is a city of 63,000 people (2016) in the Alberta Badlands region of Alberta. It's also known as the Gas City thanks to its vast reserves of natural gas. Rudyard Kipling famously described it as the city with "all hell for a basement". Medicine Hat isn't a large metropolis, and downtown Medicine Hat does not offer megastores with an excellent variety at excellent prices. However, you'll find it to be funky, hip and small-town sincere. in a battle raging on near the South Saskatchewan. and laid his feathered headdress down as a legend for our town. Medicine Hat experiences a semi-arid climate, and is one of the driest cities in Canada. Due to the aridity, it is also one of the sunniest in Canada, with an average of over 2,500 sunshine hours annually. Winters (November through March) are long and cold, but snowfall is low compared to the rest of Canada. Conditions usually alternate between mild and windy, due to chinook winds, and positively frigid temperatures frequently accompanied by clear blue skies and light winds. Spring (April and May) is short, variable and relatively wet. Snow often occurs in April, and is not unheard of even in late May. Summer (June through August) is typically hot and dry, often without a single cloud in the sky. However, thunderstorms often interrupt the bright, sunny weather late in the afternoon, and there are always a few days (particularly in June) with heavily overcast skies in which the temperature only reaches the mid teens °Celsius. Autumn (September and October) is short and generally mild, though September can bring scorching temperatures in the mid 30s °Celsius, and snow in October is usual. The season typically brings sunny and warm to cool days and cool, sometimes cold nights. 50.018889-110.7205561 Medicine Hat Airport (YXH IATA). Air Canada Express and WestJet Link fly to Calgary; Integra Air flies to Edmonton. Given the time that it takes to transfer within the airport, check in luggage and board (plus the inevitable delays that often accompany small planes), voyagers are almost always better off going by car, bus or shuttle. You'll probably arrive in Medicine Hat on the TransCanada Highway (the #1), which is the principal highway crossing Canada. If you're travelling across Canada by car, you're almost certain to pass through this city. The Medicine Hat Tourism office can be reached at +1-800-481-2822. Like many smaller prairie towns, Medicine Hat has a "largest" something. 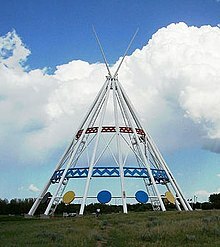 The World's Largest Teepee was constructed for the 1988 Winter Olympic games in Calgary. The city has added original First Nations artwork to the interior panels. Downtown Medicine Hat is lit with 277 old-fashioned gas lights that burn around the clock. 50.04068-110.6804291 Medicine Hat Chess Club's Giant Chess Set Project (near The Esplanade). The world's largest chess set, it features full-sized three-dimensional pieces. The tallest piece - the king - is 4 ft (1.2 m) tall, and the heaviest piece - the knight - weighs in at approximately 55 lb (25 kg) pounds. Passers-by are free to stop by for a game on this massive chess board. Visit Medicine Hat Brewing Company and learn more about their brewing process and some community history dating back to the early 1900s. The Medicine Hat Drag Racing Association is just off the Trans-Canada Highway on Boundary Road or the spectators entrance on Box Springs Road. This is Alberta's only sanctioned National Hot Rod Association (NHRA) track and is a 1/4 mile in length. The seasons typically run from May till September, with events featuring jet and alcohol cars, bracket racing, and the NHRA National open, which attracts approximately 300 cars from all over North America. The Shannon House is a historical landmark built in 1906 by James Shannon for his wife and nine children. He had purchased the land and a team of horses for $40 in 1895. The family kept the property for three generations, using part of it as a campground in the early 20th century. In 1930, they built the Maple Leaf motel on the property to generate some income. In 1990 a local family bought the property. With a view toward keeping the prominent property as part of the community, they adapted it as the Saamis Memorial Funeral Chapel & Crematorium. Riverside Veterans' Memorial Park – downtown across River Road from the South Saskatchewan River and across 6th Avenue from City Hall. It contains the city's Cenotaph, a World War II-era Sherman tank, a brick mural by James Marshall, and two Canadian Pacific Railway locomotives. "Hatters" are proud supporters of their local WHL hockey team, the Medicine Hat Tigers. The games are fun and inexpensive, but tickets sell out within days of the season opener. An arena of 4006 seats houses some 3800 season ticket holders, leaving precious few remaining tickets to be snapped up. There is a permanent pottery exhibition at the Clay Products Interpretive Centre, which houses the "Great Wall of China" (referring to the ceramic China, as opposed to the country). Medicine Hat was the home of Medalta Pottery and Hycroft China, two of the most important industrial pottery factories in the early twentieth century. Downtown Walking Tour; Maps for a self-guided walking tour can be found at the Tourism Office for free. During the spring/summer time there's always a chance to see many bison mating. The Medicine Hat Family Leisure Centre is the largest indoor multi-purpose sports facility in the city. In the north end of the city, the facility includes an Olympic-sized ice rink, 50 m (160 ft) pool, waterslide, diving platforms, kiddies' pool, wave pool, indoor soccer facility, track, and fitness centre. There are over 100 km (62 mi) of walking trails in the city. All of the major parks are linked by the extensive trail system. Police Point Park was an early North-West Mounted Police outpost. It has 300-acre (1.2 km²) and shale paths next to the South Saskatchewan River. It is one of Southern Alberta's well-known birding destinations. The Medicine Hat Interpretive Program building is on-site, to run programs and inform the public about nature around the city. Strathcona Island Park is along the south bank of the South Saskatchewan River. The park has 5 km (3.1 mi) of walking trails, playgrounds, a water park, ball diamonds, a pavilion centre, washrooms, ice skating, kitchens and fire pits. The park is heavily treed. Kin Coulee Park is located along the banks of Seven Persons Creek. This 100-acre (0.4 km²) park is almost entirely manicured. The park features a skateboard park, two ball diamonds, beach volleyball courts, fire pits, a band shell, washrooms, and two playgrounds. It is the venue for the annual Canada Day festival and fireworks. Echodale Regional Park is a 650 km² (251 sq mi) park that has a swimming lake, beach, walking trails, fire pits, canoe rentals, paddle boats, snack bar, washrooms and historic ranch. Medicine Hat Mall, 3292 Dunmore Rd SE, ☎ +1 403 526-4888. Anchored by The Bay. Also, the Galaxy Cinema and a large food court. Sweet Regards, 417 3rd St SE, ☎ +1 403-488-8063. Don't miss a visit to Medicine Hat's only candy store. Nostalgic candy and unique candy all make the stop worthwhile. Sweet Regards is also the Candy Bouquet Franchise for this area. The shelves are full of custom designed and creative candy arrangements. There is also a Wal-mart Supercentre, a Canadian Tire, and many independent specialty stores. The Cracked Peppercorn, 3216 13 Ave Southeast, ☎ +1 403 526-0829. [dead link] Mario's Restaurant, 439-5 Ave SE, ☎ +1 403 529-2600, e-mail: info@mariorestaurantandpub.ca. The Corona - Top 40 and dance music. Popular with younger adults (18-24) as well as adults. [dead link] Liquid Concert Venue & Niteclub, 638-14th Street SW, ☎ +1 403-527-5170. Concert venue, bar, night club. A large club with a great sound & light system. Ralph's Texas Bar and Steakhouse - Very large bar with multiple floors, separate pool hall, and restaurant. Country-western, rock, and some Top 40 music. Temptation Nightclub (formerly Gringos; Hazzard County Roadhouse) Open Th-Su. Lingerie contest on Th. Featuring the only live Video DJ system in Medicine Hat. DJ-E spins live video mixes all weekend. 1,000 square foot dance floor. Whiskey Creek, 937-13th Street SW, ☎ +1 403-528-3140, e-mail: info@whiskeycreekpub.ca. Closed Sundays & holidays. Daily drink specials, live bands, and comedy from the Laugh Shop every Thursday night. Large dance floor. Medicine Hat Comfort Inn & Suites, 1799 Trans Canada Way SE, ☎ +1 403 504-1700. Indoor pool, hot-tub, fitness centre, free Internet. Medicine Hat Lodge, 1051 Ross Glen Drive SE,, ☎ +1 403 529-2222. Indoor pool and waterslides, hot-tub, casino, spa, lounge, restaurants. [formerly dead link] Motel 6 Medicine Hat, 20 Strachan Court SE, ☎ +1 403-527-1749, e-mail: mdavies@d3h.ca. Offers guests a variety of comfortable accommodations, hotel services, hotel packages and a pet and kid friendly atmosphere. Medicine Hat Public Library is across the street from The Esplanade. Echo Dale Regional Park; West of Medicine Hat; +1 403 527-7344; Site of restored 1887 house, a blacksmith shop and a coal mine. May long weekend to end of August. This city travel guide to Medicine Hat is a usable article. It has information on how to get there and on restaurants and hotels. An adventurous person could use this article, but please feel free to improve it by editing the page. This travel guide page was last edited at 19:02, on 1 April 2019 by Wikivoyage user MuzikMachine. Based on work by Wikivoyage users Traveler100bot, Ground Zero, Traveler100, TheTrolleyPole, J73364, Wrh2Bot, AndreeBot, Robkelk and Ikan Kekek and others.